When your oral health has been seriously impacted by tooth decay and gum disease, your level of confidence takes a huge hit. In addition to wanting to hide your smile, your quality of life tends to suffer while you deal with the challenges of a poorly functioning mouth. Now, you don’t have to hide your smile or deal with the challenges of a poorly functioning mouth. Dr. Allan S. Mohr, DDS at Smile Creations offers full mouth reconstruction in Long Island. Dr. Mohr will restore the function and appearance of your smile to shine brightly. With reconstructive dental services, we’re able to resolve the challenges you face with a poorly functioning mouth. Not to mention, we’ll fix the appearance issues that hurt you emotionally to allow you to regain an amazing, confident smile. Using our oral reconstructive services, such as porcelain veneers or dental implants, we are able to repair a number of different factors impacting your oral health. To determine the procedures that will work best for your individual needs, we will fully evaluate your mouth to create a customized treatment plan. To determine the ideal services to meet your needs for an exciting new smile, we will fully evaluate your oral healthy using the best technology in dentistry. We will look deeper than just the appearance factors to look beyond what’s seen by the naked eye. 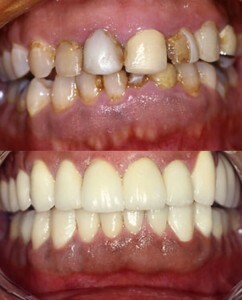 We will take x-rays, intra and extra-oral images, and Panorex images for a clear picture of all areas of oral health. In addition, we will look at your teeth and the soft tissues to determine the main areas of concerns. For those who are missing teeth, we offer dental prosthetics to fill the space. No matter if you’re missing one tooth or all of your teeth, we offer the restorative procedures you need to replace the missing tooth for a complete, functional smile. Using dental implants, implant supported dentures, and fixed bridges, we will repair your smile. When teeth have become severely damaged or suffer from extensive cosmetic flaws, we are able to enhance the appearance of the teeth while preserving the teeth from future damage. Using natural -colored fillings and crowns, we will repair areas that have become damaged to prevent future damage as we save your tooth. Now, you’ll have a beautiful tooth to last a lifetime. Porcelain veneers are commonly used for mouth reconstruction procedures. Using thin porcelain shells that are fitted to the front side of the teeth, you’ll instantly have a whiter smile while we hide cosmetic flaws. No matter if you have misshaped teeth, small alignment issues, discoloration, or chips and cracks, we will fix these factors for a naturally beautiful smile. As we age, it’s natural for our smiles to lose some of their luster, as well as function. Now, you don’t have to deal with these challenges with full mouth reconstruction in Long Island. Dr. Mohr is here for you to create a stunning new smile to restore your confidence and enjoyment for life.